Welcome to Positive Images, Positive Effect, founded by Paul Lee in 2008 on the belief that it is only when we have a positive image of ourselves and others that we can truly achieve our full potential. What difference does Positive Images, Positive Effect make? Team building and problem solving workshops give children and adults the tools to work effectively with others to overcome some of the challenges that growing up and the working world throw at us. Founder Paul Lee brings over 30 years of experience in training, experiential learning, coaching and personal development. Training programmes are always crafted to your specific needs. All of the topics below can be tailored for schools or businesses, children or adults. 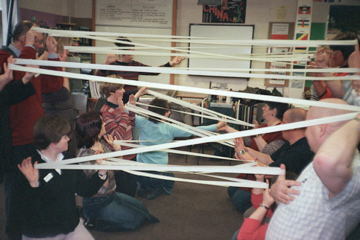 All team building activities are wholly inclusive, meaning everyone can be fully involved. The strategies and activities you will learn can and will make a difference in your work with all people, regardless of age, ability, gender, stength or agility.